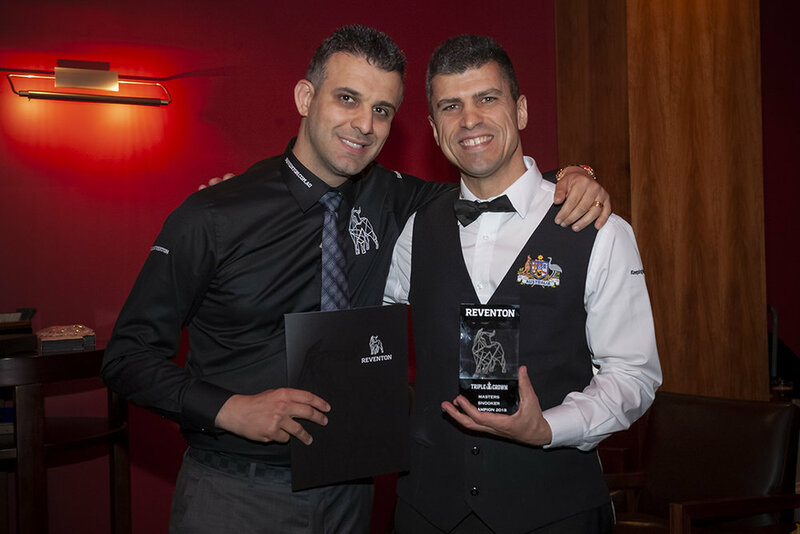 The final Victorian Snooker tournament of the year in the guise of the Reventon Masters, in which the top 10 players in the Reventon ranking table that is made up of the points accumulated during the year across any 6 of all the Australian National ranking tournaments, plus 2 wild cards selected by Chris Christofi and Neil Robertson, for the chance of winning the perpetual Neil Robertson trophy and a very generous cheque for $15,000, was held over the past weekend at the R.A.C.V. Club in its magnificent Billiard room which is also home to the Australian National Championships. The elite 12 players with the exception of Matthew Bolton from W.A. who was not able to attend, were Aaron Mahoney, Steve Mifsud, Johl Younger, Adrian Ridley, James Mifsud, Ben Judge, Shaun Dalitz, Ben Foster, Kurt Dunham, Tyson Crinis and wild cards Hassan Kerde and Adam Bleumink. Two groups of 6 players contested a round robin event during the first two days with the top four from each group then pitted against each other in the Quarter Finals. The Semi Finals were then played on the final day of the festival with the two players from each group who did not make the quarter finals and the losers of those 4 matches making up the 8 needed to play the OneforSeven event with another $1000 in prize money up for grabs. Johl Younger proved to be the one with the highest finishing total in this exciting and fast format of the game and was deservedly rewarded. The 2 semi-finals were between Aaron Mahoney and Kurt Dunham in the 1st and Steve Mifsud and Ben Foster in the second. Both proved to be extremely competitive as expected with the first needing a final frame decider and the second going to 8 out of the scheduled 9 frames. We were then treated to more of Chris’s generosity as this also encompasses the up and coming players in our great sport. A junior challenge was held between Victoria’s Marc Fridman with former junior Brendon Lang filling in for Tasmania’s Alex Pace who was not able to attend until too late in the day to take up the challenge. The tournament referees were Jim Lewis, match referee and also senior referee for the OneforSeven event, Neil Brown who had charge of the Steve Mifsud, Ben Foster semi-final, Neil Allison who was the official for the Aaron Mahoney/Kurt Dunham semi, Anuj Rathee who once again proved himself to be worthy of his place in these events, Abraham Newman, fresh from his upgrade to Class 2 and the volunteer referee for the junior challenge match and last but certainly not least, Brendon Lang who realised his ambition of taking charge of a Grand Final where his performance only enhanced what was a very competitive and exciting match. Kurt managed to get his nose in front at the end of the 3rd frame after losing the 1st and taking the 3rd with a very neat 48 break but it was Steve who then took centre stage in winning the next 5 frames on the trot. A total of 4 breaks over 50 in the 6 frames he won to take the trophy, prize money and accolades proving once again what a champion he is.